One of the interesting things that I did to discover “Goa beyond beaches” was visiting the Indian Customs and Central Excise Museum in Panaji. I know that a name like “Indian Customs and Central Excise Museum” does sound uninteresting and you kind of wonder – What??? Is that even a museum? I did too, but when I visited it, my image of it completely changed. It was one really interesting and unusual museum. It was like delving into the minds of a customs officer as he battled against the notorious smugglers. The entire museum is set in a heritage building known as the “Blue Building”. Owing to the heavy rains, I could not take a picture of the literally “blue” building. This was an ancient Portuguese building that was used as a Customs office but now has been converted to a double storied museum on Indian Customs and Central Excise. 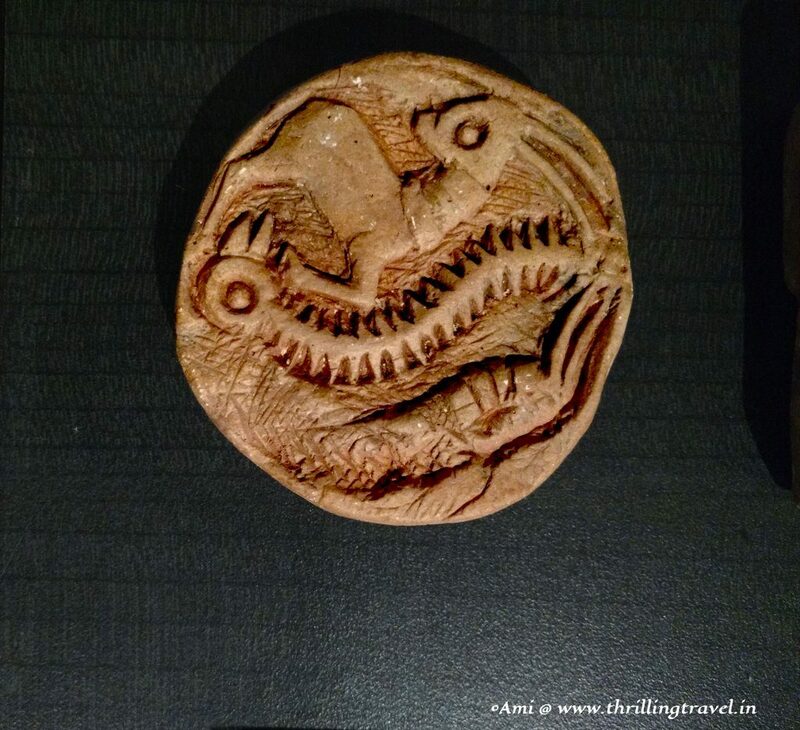 The first section that you encounter here is devoted to the ancient history of taxation – the first evidence of that leading to the Port trade at Lothal during the Harappan Civilization of 26th century BC. 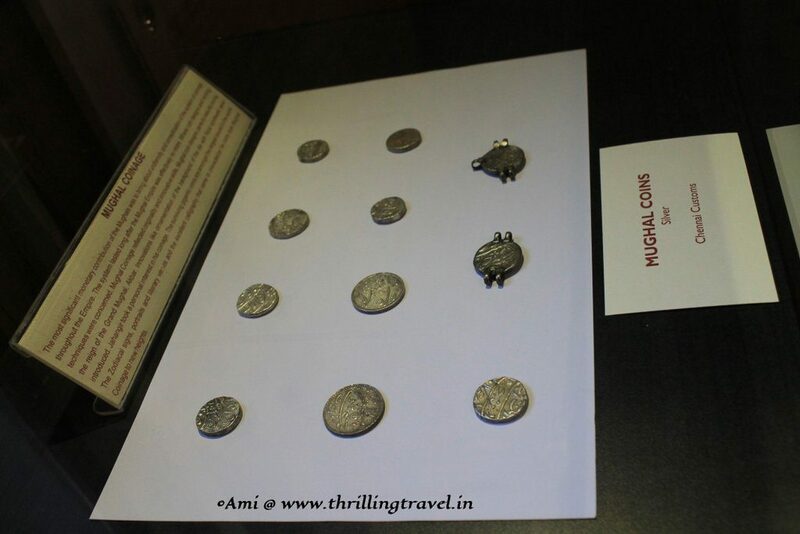 Replicas of various seals used by the Harappans at Lothal, by the Mauryan civilization (4th Century BC) and coins from all these eras as well as the latter ones of the 16th century Mughal Era have been displayed here. The coins are the ones that have been recovered by the various customs in India. Have a peek at them. QUIZ: Can you spot the unusual Mughal coins with hooks on them? The section also, brings to fore the ancient laws of taxation that have been written by Chanakya in Arthashastra. 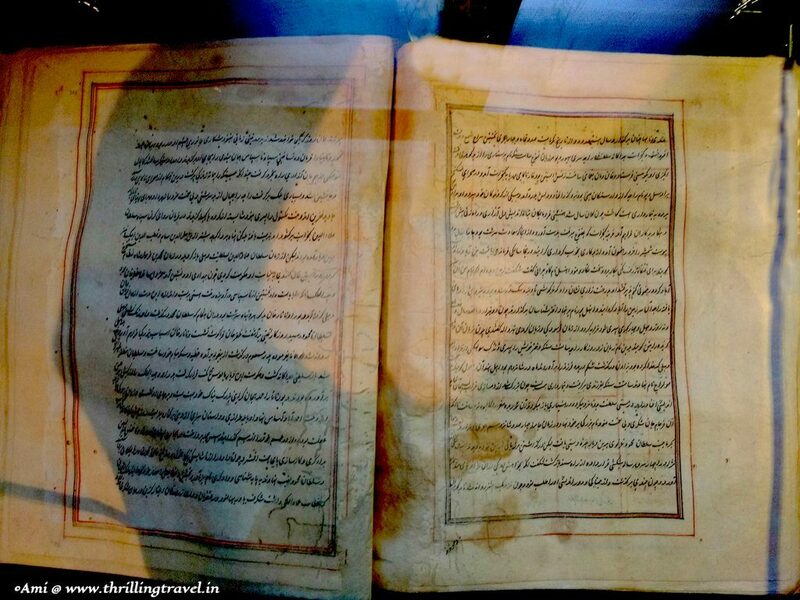 The highlight of section was an actual page from Akbar’s Ain E Akbari is displayed here. The page displays the taxation laws in the 16th century AD as made by Mughal emperor Akbar. 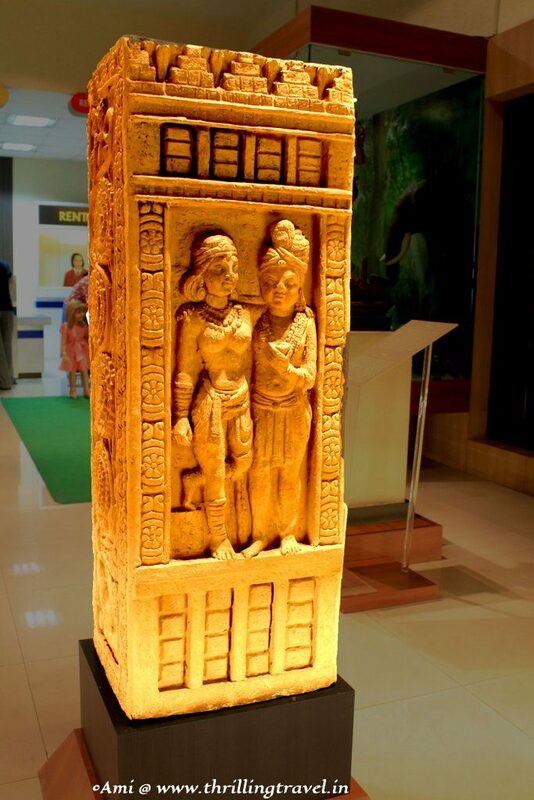 This is one of the originals that was recovered by the Patna Customs. Or these cycle tyre tubes that were filled with opium. Or the gold bars that were seized in the toilets of a ship. The section has some interesting cases on display that made me think of the lengths that people do to achieve their means. It also, made me realize how “full of wits” is this game, where the customs officer has to be one step ahead. Definitely raised their esteem in my eyes. The original Amin Pillar was seized in UK and brought back to India. What you see above is just a replica of the original treasure. This one has an interesting story. 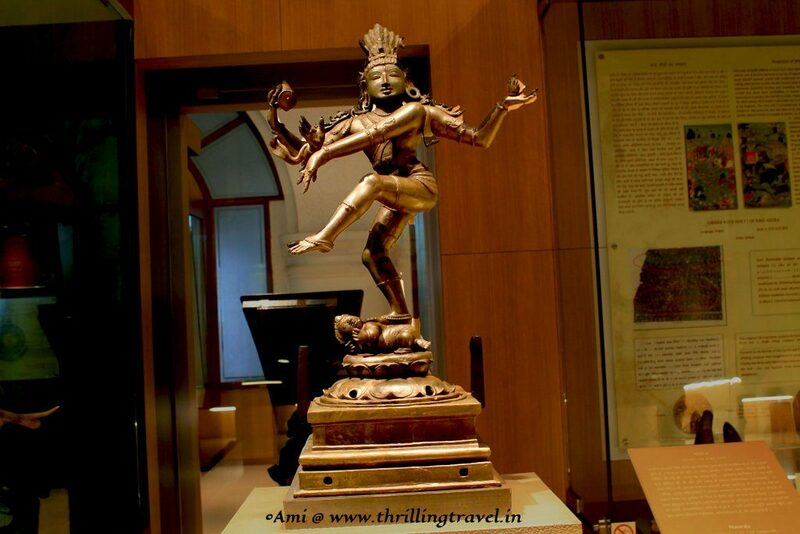 The original Natraj statue belonged to a Royal family and was being smuggled out of India through Kolkata. The same was being passed off as a package of books to USA. The Kolkata customs caught on and this became one of the sensational captures of that year. The statue above was another amazing catch by the Gorakhpur customs. This one was filled with semi precious stones as well. Turtle shells, snake skins, animal furs and ivory articles were the most common ones seized by the Customs. 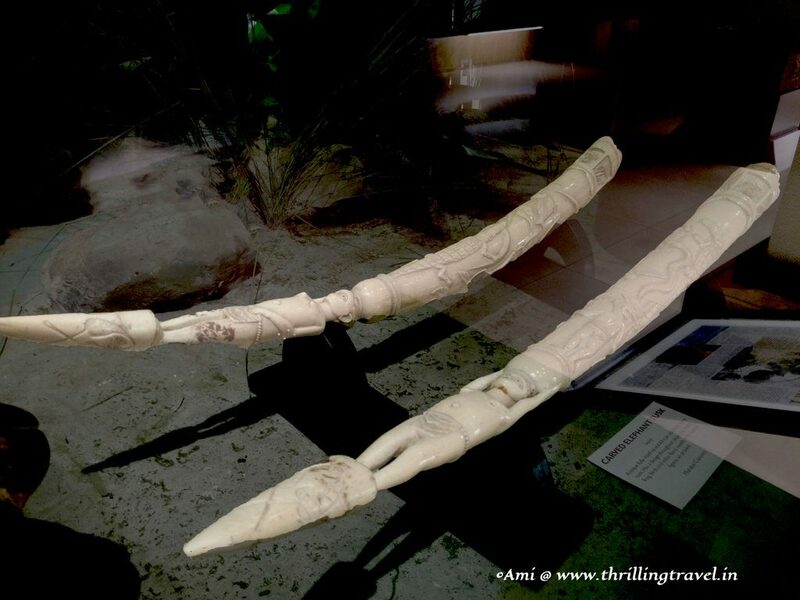 The exhibit anove are Tusks of an African Elephant with intricate carving on them. These are banned items and were seized by the Mumbai customs department. I spend considerable time on this floor as I found each artifact and its story of what it was and how it was recovered quite interesting. It felt as if I was reading a crime novel. As a part of the experience, we were also, treated to a small Audio Visual on the various achievements of the Central customs and excise teams in India. It really made me proud to see their achievements. From here, I moved up to the 2nd floor where there were models of the chemicals and forensic team as well as stories from the dreaded narcotics section. Aside from the Diorama on Narcotics, I personally did not find this section very engaging. 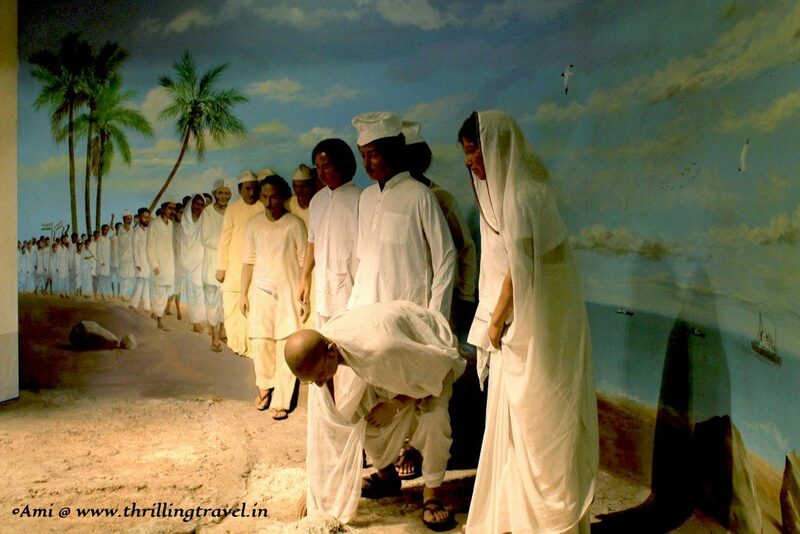 Besides the diorama that you see above, there was one of the famed Dandi march. This was in the taxation section as a reminder of the unfair laws of taxation laid by the British. With this, my tour of the Indian Customs and Central Excise Museum came to an end. I found myself pleasantly surprised with this museum. I found the displays quite well-arranged and the information adequately placed. 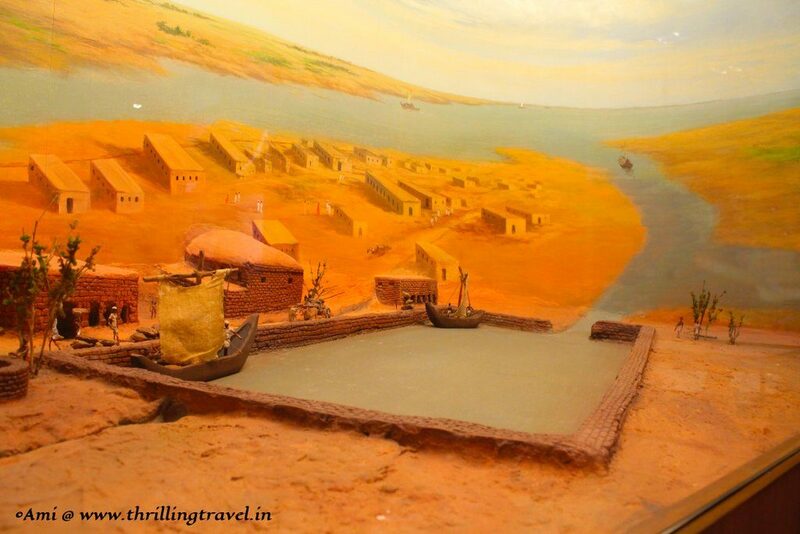 The museum is a small one and is quite central to Panaji. It is a quite an eye-opening experience on a subject that most of us are unfamiliar with. Definitely another gem in the “Goa beyond beaches” itinerary. 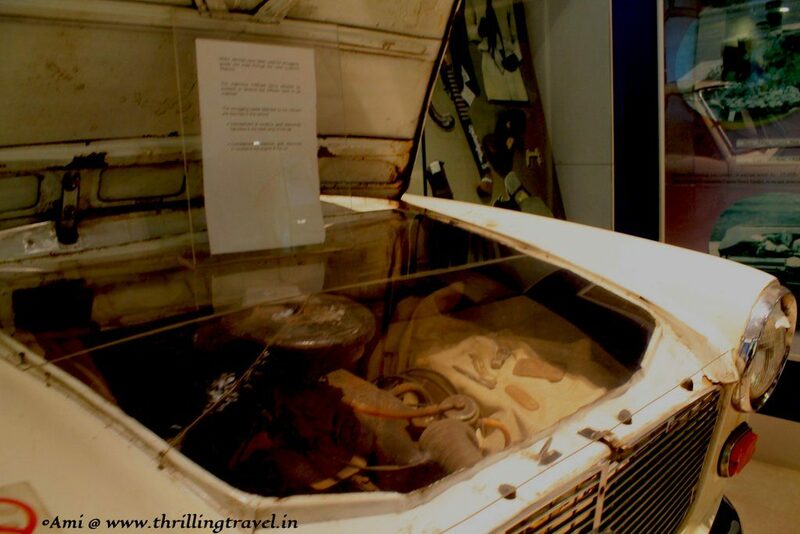 Here is a pin to remind you to spend some time at the Indian Customs and Central Excise Museum of Goa – definitely an experience from the crime novels that you so enjoy. Goa has its own airport and is well connected to the rest of India by road and rail as well. The Indian Customs and Central Excise Museum is located in front of Panaji Jetty. It is also, referred to as Captain of Ports Building. 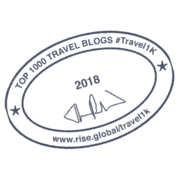 You can reach here with any public transport – bus, car or an auto. 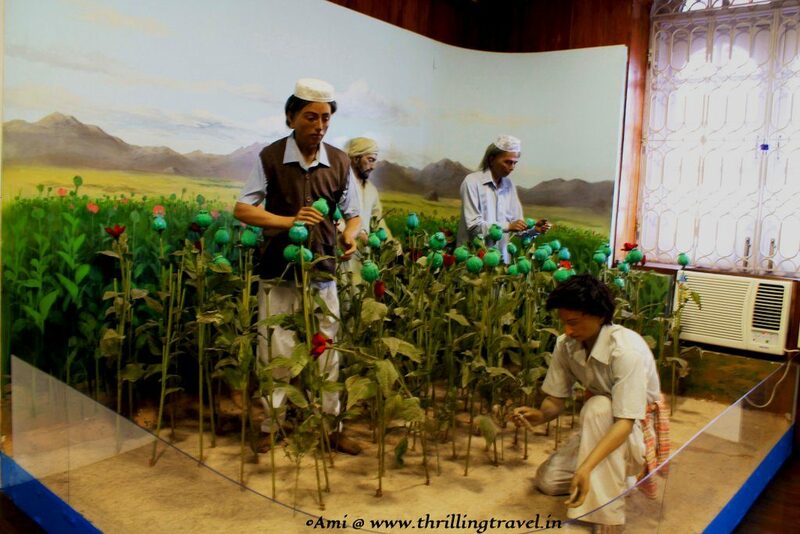 You can visit this museum on all days except Monday – between 9:30 am to 5 pm. The entry fees for the museum is just INR 10. You can avail of an audio tour by giving a small deposit of INR 50 for a tab. By pointing the tab at designated locations, you can get a complete audio tour of that section. The museum is a small one and one requires only 30 mins – 1 hour for it, depending on your interest. There are no charges for the camera. P.S: I was hosted by Goa Tourism Board for this trip. However, the views expressed on this blog post are completely and honestly my own. Nice pics Ami, and I am a bit surprised that in Goa you are allowed to take shots with your camera in the museum. I once had to leave National Museum in Delhi as I was carrying one. Quite a few museums allow a camera at a cost. Of course, here it was free. I guess, it depends from museum to museum. Thanks Shweta. It was a pleasant discovery. I love museums. But, never imagined the customs museum to have so many treasures. Should visit it. Wow, this looks like a very fascinating museum! I didn’t know some museums allowed you to take photos either! Thanks. Some of them definitely do, even Vatican does as does the British museum in London. As long as you don’t use flash, they have no objection. What an interesting place. I think my kids would love it too! I love that it helps people appreciate customs agents, probably a thankless job. It sure is. It opened up my eyes too. Never realised the pains they have to go through. I have a school friend who loves unusual museums. She has traveled all over the world. I am sharing this with her! Thanks Alana. Am sure she will love it. That is definitely a place I would like to check out! I can’t just lay on a beach and nothing else. Very interesting and unique indeed. Have to admit the name didn’t bubble interest for me, but…this place sounds really cool. Wow it is amazing some of the lengths people go to smuggle things into the country – it makes me wonder what people still managed to get through customs, despite all these checks! Yes, it is amazing to see the lengths people go to do things. Glad these guys are vigilant enough to stop some. When I first heard the name of this museum I did not think it was going to be such thrilling museum. However, this museum sounds super interesting! I don’t understand how they catch these people that are this clever. Going through customs in some countries is a pain and others don’t even seem to care or check. Haha, I was always baffled by that. Indeed. This opened my eyes to the entire customs thing. I have a new found respect for them. This actually looks like a really interesting museum, despite the slightly dry sounding name. I do find it fascinating to hear about the lengths smugglers go to to try and hide their goods from customs officers. That is really a unique museum! The section devoted to the Battle of Wits section is my favorite. A reminder to not store your gold bars in the toilet, that is the first place they look! Ha ha. And the lunch boxes too. Did you notice that in the picture? This is really a very special museum. How could i missed this when I was in Goa. Too bad. Wish i could go back. Thanks. Now that you know, you should make it the next time on. Hope you get back soon. Wow, had no idea something like this exists. A good break from the beaches of Goa, truly! I will have to add this to my list for my next Goa visit. Thanks for sharing! Thanks Aparna. It is quite central and interesting. You should definitely go. 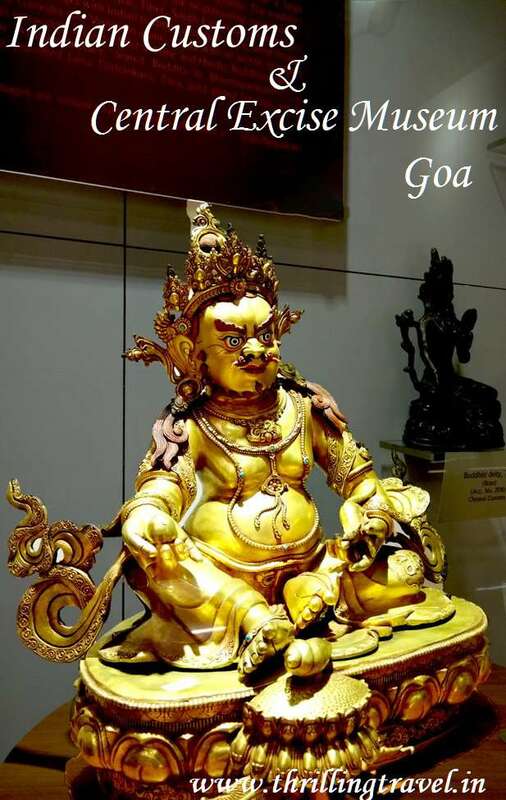 Such an interesting museum and to think of it , I have been to Goa so many times and never visited the same…the pictures themselves tell such interesting stories.. Thanks Prasad. It is “Goa’s secret”. 🙂 I am sure you will find something that appeals to you. When I read the name of your post, I thought exactly like you! Your post and pictures quickly changed my mind though! Indeed. It was a pleasant surprise for sure. What a lovely collection the Museum had.. The seizures section is indeed a treasure trove of our heritage and culture. thanks for sharing the information about this lovely museum. Thanks Vyjay. The museum was quite a surprise for me. 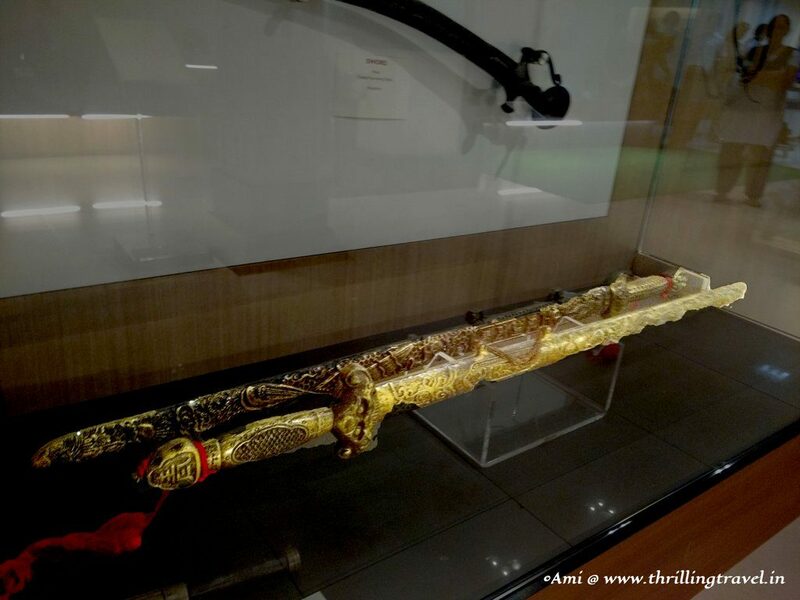 Very interesting museum to visit,enjoyed reading this post. lovely shots. never heard about it.thanks for sharing. Thanks Jyotirmoy. Hopefully you will visit it the next time. I am a closet detective – love crime shows and books. Not a big museum fan generally but there are always exceptions and this looks like just that for me. Such a great way of showing local culture. Fascinating. Then this place is definitely for you. I could feel the same thrill as I do when I read crime novels. Never heard of this type museum before, but it looks interesting. So much treasure and art! Thanks Nina. It is quite a unique one. This is so fascinating. I’ve been to Goa twice and never heard of it. Not sure when I will be back but this is definitely something I would find worthwhile. Thanks Anne. Definitely keep it in mind for your next visit. It is quite central and worth a few minutes for sure. Thank you Rajlakshmi. It is indeed nice to know Goa beyond its coastline. Every time I read about the Indus Valley civilizations , it comes across strongly how well organized those people were. I have a penchant for exploring forts and museums but I had missed this one in Panaji. Interesting to see that they allow cameras inside the museum. Thanks Somali. 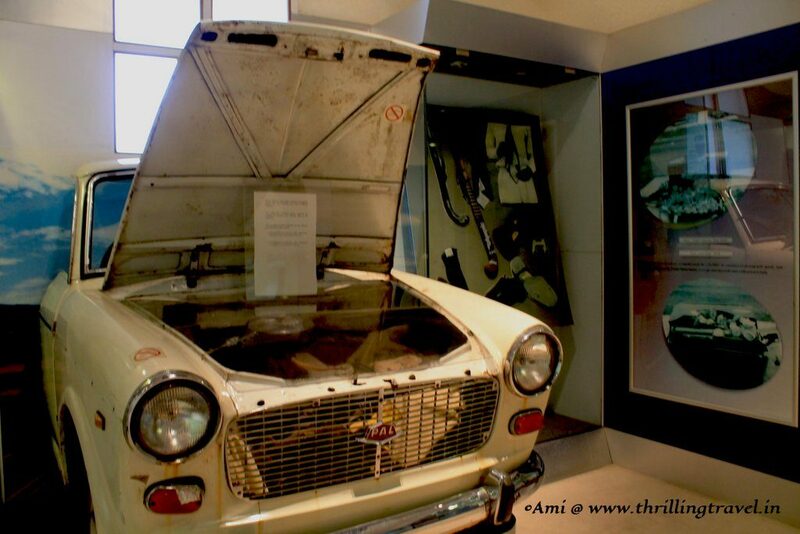 You are sure to love this museum for its unusual exhibits and stories. To be honest, this is the first time I heard about a museum on Central customs. Going through your post I am very intrigued with the whole place. The Battle of wits section looked very interesting. Thanks for the share Ami, definitely worth a visit while in Goa. Thanks Suma. It sure is an unique one. This sounds very interesting to me, Amy. There’s a finance museum on Wall Street in Manhattan that covers some similar issues. It’s always more rewarding to discover places “beyond beaches.” I usually skip the beach altogether! Great guide and beautiful pictures! Even though we have visited Goa so many times, never heard of this museum. Nice going….interesting stuff. Thanks Sapna. You should definitely stop by this one. I know you will find some really quirky stuff here. Looks like a great museum, really interesting! 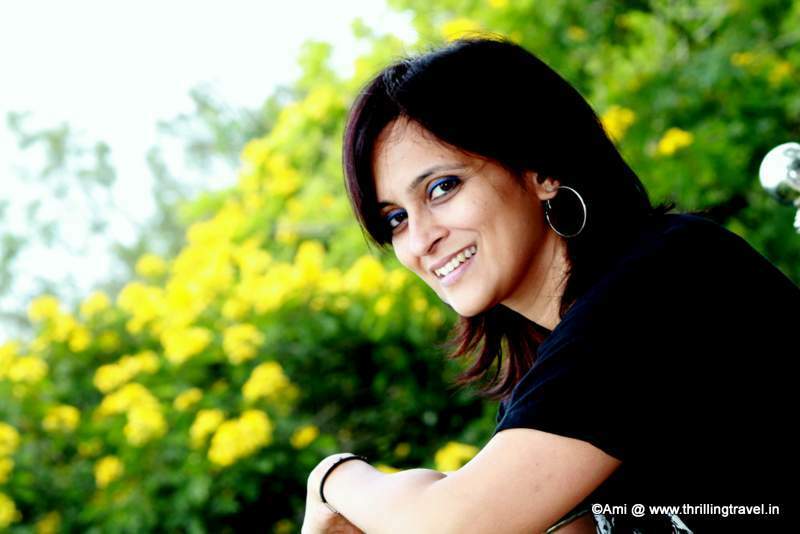 Recently, I’ve met our new office colleagues who is from Goa, and I shared to her your blog. She looks shy, but when I ask her about Goa, she is very enthusiastically shares how beautiful Goa is, and she guarantees we will like it too. Well based on her actions, I guess we will! Thanks for sharing us how beautiful your place is. And I hope that more visitors would understand your cultures and traditions. Can’t believe that I’m reading another post about Goa today in the similar thread! I went to Goa several times during my college days and loved it! Though I didn’t know anything about this museum. Your post made me nostalgic about my good old college days! LOL….that is true. It reminded me of them too. 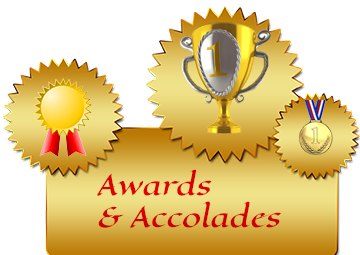 Wow what interesting showcases, thank you for taking the time to write about each of them and share a little bit of history! Thanks Suanlee. Glad you liked it. It definitely brought a different perspective about the role of customs at the airports, seaports etc. Knowing history is always exciting.I can spend hours in any museum that I go to. Thanks Sona. Definitely an enlightening perspective to customs. Am sure you will love this one. I just love reading about Goa. This is one of favourites in India. I never knew goas has such beautiful museums. I have never been here before but i plan a trip real soon by next year. Such an interesting post.Museums can be rather interesting.I would love to check the seizures sections. This looks like an interesting museum. What a treasure trove! The pictures are wonderful and it is nice to see another side of Goa. I am glad I chanced upon your post! 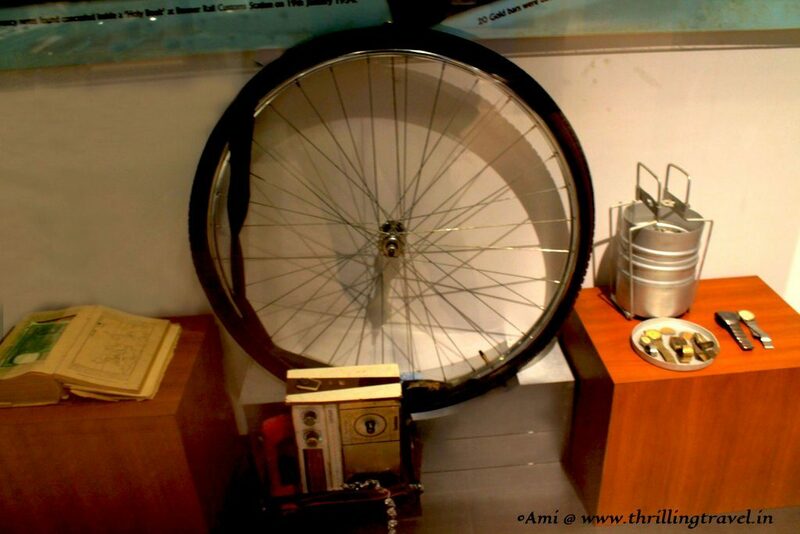 What a quirky museum; totally my kind of place! My favorite section from your post was where you mentioned ‘battle of the wits’ section. My favorite too. It was indeed a nice way to understand the pains the officers go through to catch these crimes. This is a really interesting post on one of the probably least visited places in Goa. It does provide a different perception to the importance of customs department although most of us see them as an inconvenience. Thanks Tamshuk. It does make you appreciate that inconvenience. That is a museum that I would love to visit! I used to watch different “Border police” series where customs would find a lot of smuggled items inside places where you wouldn’t even imagine. I used to enjoy those shows a lot, which means I will really like this museum. Wow great to read something a little different with lots of information. I adore museums! What a cool museum! I’d totally love to check it out! 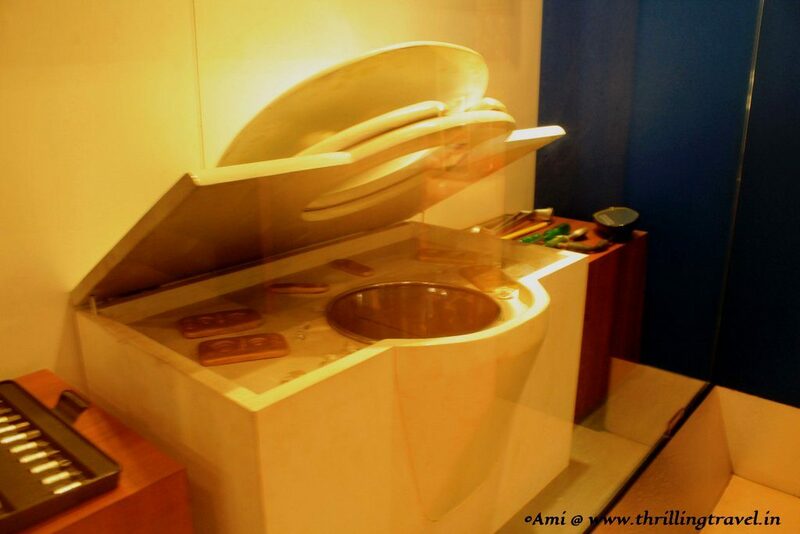 A museum on unique concept that too in Goa which I have never heard before. Yes, name is quite uninteresting but not the post, excited to visit the place in my next go to Goa. Thank you Priyanka. Glad you like it. This leaves me with awe. Such an interesting Museum. Love this worth reading blog. 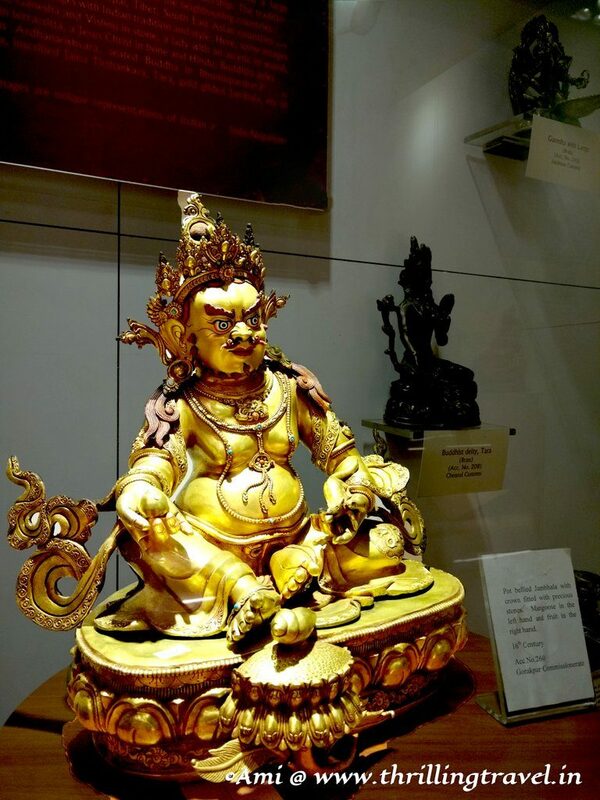 We had never heard of a customs and excise museum and wondered what would they exhibit but it surely sounds intriguing especially all those amazing and graceful statues. Me too…I was expecting some boring scripts and displays but this completely surprised me. I would love to see this museum. Hopefully the weather would be better and I could take a picture of the blue building. I would also like to see the gold bars that were hidden in the toilet! We haven’t find our way to India yet, but I am putting this place on our must do list! It is fascinating how people get creative when it comes to smuggling, lying and earning money illegally. With all the beautiful artifacts it is a bit funny to see the toilet with gold bars, though I suppose that is also pretty interesting too! Super cool to have a seizures section of a museum, I don’t think I have ever seen such a thing! Neither did I till this museum. I love the uniqueness of it. They have got such exquisite stuff and people dont even know of this museum. And who could have thought something like this existed in Goa of all states in India!!! Loved the post Ami. Thanks Varsha. I hope you make a stop here the next time. You will love it.